Though it has only been a few days since our last check in, the crews of the Eliza Sue and Avelinda have accomplished and experienced a lot since our stop at Soldier Cay. Surveys have been conducted by both the reef fish and elkhorn coral research teams at multiple sites within the Exuma Cays Land and Sea Park. 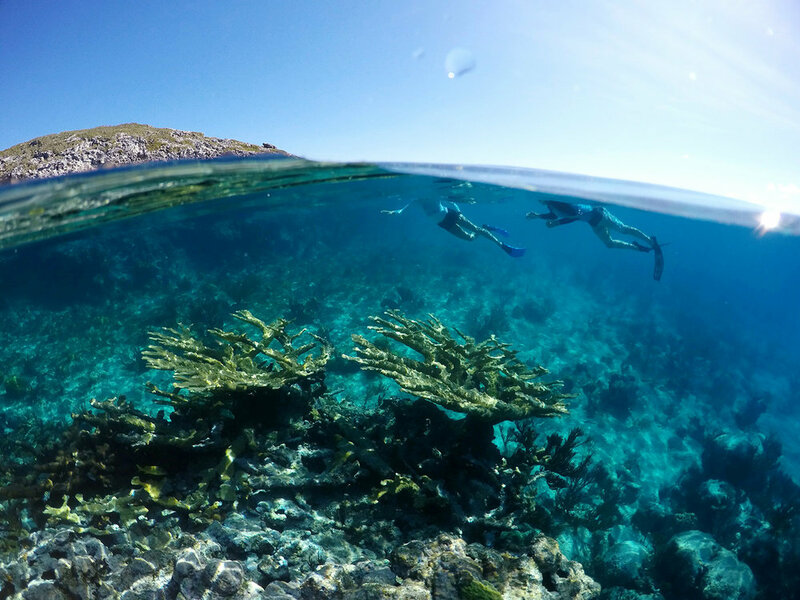 The large elkhorn colonies and populations of reef fish at Cambridge Cay and Rocky Dundas provided the perfect opportunity for the teams to put their research skills to use, and snorkeling these vibrant reefs was an incredible experience. 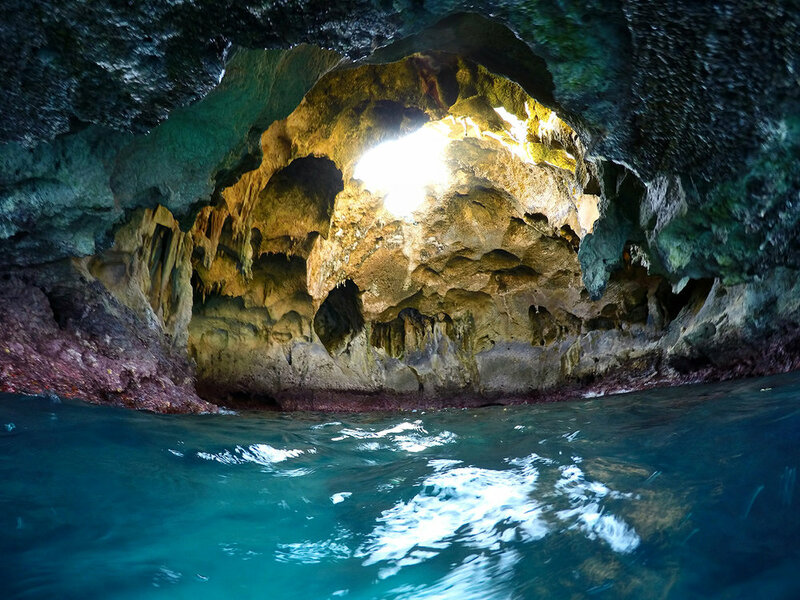 We also had the opportunity to snorkel into two caves on Rocky Dundas which were an amazing display of the geology of The Bahamas. During the night following our big day of research, we rafted the two boats together so the two crews could share dinner and enjoy a lesson on stars from Sockeye. Yesterday we got news of a cold front heading our way which would bring rain and potential thunderstorms, so both boats sailed to a protected cove on the southern end of Pipe Cay and hunkered down beneath our tarps for the day. After a few hours of reading and playing word games, the skies cleared enough for some snorkeling and island exploration. As one group explored the driftwood strewn beach, another snorkeled the rocky shoreline where we successfully captured a lobster (which provided a delicious appetizer for the crew of the Eliza Sue) and swam with a nurse shark. Before dinner, Andrew gave us an informative lesson on weather so we could better understand phenomena like cold fronts and low pressure systems. Today our crews are re-energized after our relaxed storm day and are ready for more sailing in the sunny and breezy weather that the cold front brought once the rain had passed. We're looking forward to restocking whatever fresh produce we can get at Black Point and then beginning our journey back north and the adventures that will bring! Friends, Family, and Alumni, The Fall 2016 semester is flying by. Because we’ve been so busy, it feels like only a few short weeks ago that we were unpacking our things and circling around the flag pole for the first time, but it only takes me realizing all that we’ve explored and accomplished over these past 70 days to realize just how long we’ve been here. Time is definitely a challenging concept here. We often say, “Every day feels like a month and every month feels like a day,” simply because of how fast everything moves, but also acknowledging all that happens in one day. The way that I’ve learned to define time here is by the friendships and incredible connections that grow on a daily basis. The Island School is a really special place in that you are constantly surrounded by interesting, kind, and extremely supportive individuals that care so much about your own personal success. The friendships that I have created here with my peers are indescribable and so cherished, but my valued relationships aren’t limited to students. I find myself having a new, thoughtful conversation with a new member of faculty, a member of CEI, or a hardworking individual from the farm just as often as I do with my close peers. Both types of relationships are easily attainable and immensely valued by all of the students here. The community and connections that I have established here are two of the main reasons that I have become so attached to this place I now call home. These wonderful connections only deepened and expanded over our three-week Expedition period. As we were split up into four different Kayak or Sail groups, people were worried about leaving their beloved routine and friends for three weeks, but little did we know all that was ahead of us. I embarked on a 9-Day Kayak trip the first week of Expeditions and was really excited about the bonding of my group, the friendships I’d be able to deepen, the solo experience, and all of the adventures we had ahead. I knew it was going to be both a challenging and rewarding week, but what I didn’t understand was how happy I would be when I’d return nine days later. Solo fell towards the beginning of my kayak trip and I couldn’t be happier that it had. The exciting 48-hour experience that all Island School students think about when they apply had finally arrived and it was more emotional than I’d anticipated. While leaving one of my best friends at the very beginning, we both broke down into tears, not from sadness, but from feeling so much excitement and anticipation all at once. Once I had settled into my spot and looked out at the beautiful beach and ocean in front of me, the tears immediately ceased. Where I was and the incredible opportunity that was lying in front of me instantly made me so appreciative. During my solo, I was forced to live in the moment, taking the experience minute by minute. I was so content for the duration of my solo as I was able to reflect, write several pages in my placebook, and recharge. Coming back together with my group afterwards was one of the happiest moments I’ve felt here and it enabled us to have finish our last 5 days on a really high note. As we kayaked back to campus the morning of Day 9, many of the faculty and students were out on the jetty cheering us on as we finished our final stretch. Seeing campus and the community we had missed so much filled our boats and bodies with pure excitement. As we reunited with the rest of the groups, the dorms and dining hall were full of nothing but stories and happy spirit. This energy carried over onto our Down Island Trip that followed. Exploring the island as a unit as we discovered the several impacts of tourism on this country was really interesting, eye-opening and our group was just overall excited to be back together for another 5 days. All 50 of us are back on campus now, finding ourselves back into a pretty steady academic routine. As well as coming back together as a community, it’s crunch time for our research classes, we’re preparing for our art show, and our respective run and swim tracks are reaching our max-workouts before the 4-mile swim and half marathon. Campus is buzzing as we begin to prepare for Parents Weekend. We’re all very excited to welcome our parents to campus and share all that we’ve learned in just a few short days. After a day of activities, one big class, communal meals, and down-time, it is movie night! The Incredibles is playing on the big screen tonight, and the pillows and cushions that students set up are more comfortable than any theater. "We went through a few great activities this morning. We focused on our DOLs which is our 'Demonstrations of Learning.' We saw a great example from Pat and we'll be working on this for the next week." "We brainstormed this morning in our placebooks...I experienced some self-acknowledgment...feelings and connections." "The cots are interesting...they make me feel like I'm in M*A*S*H*." "What people don't understand is that this is adjusted living and we need to be cognizant of that. It may not be your biggest or best meal but you've got to adjust. As Liz Slingsby would say, flexibility is the best ability." The day is winding down, but we continue to keep a watchful eye on the weather. We know for folks watching at home the weather channels and news outlets are talking about storm surges in the Bahamas. While the storm is powerful, we hope you all feel confident in the campus we call home. Our unique position on the western hook of South Eleuthera and off the Exuma Sound protects our campus from flooding. Nearly ten years ago, our campus weathered a Category 5 hurricane. The storm surge never came above the deck of our dining hall, providing us all reassurance in our position on the island. For information about how a storm surge might affect our location, please see this graphic provided by Weather Underground. We plan on structuring tomorrow in a similar way as today. CSD will continue to be a space for work, play, and relaxation. We will continue to update the blog and our social media outlets while we have access to internet. We want to reassure you that our teams are prepared to their fullest but would also like to prepare you for them being out of touch. We have three satellite phones on campus that will provide updates if we can get a signal out. As soon as our Boston Office hears an update, they will be passing along messages to all concerned parties. Continued thanks to everybody who has reached out to us, and goodnight from Eleuthera.